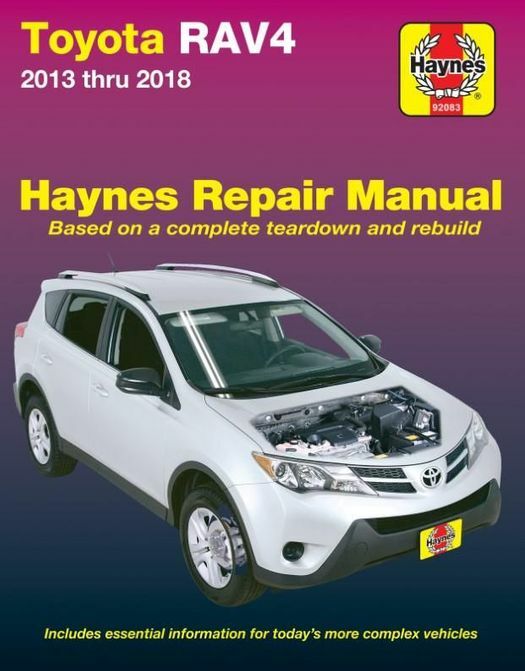 The Haynes 92083 - Toyota RAV4 Repair Manual provides outstanding and detailed DIY repair, service and maintenance procedures for the 4th generation XA40 Toyota RAV4 2013 thru 2018 models built and sold in the US and Canadian markets. NOTE: This manual does not cover information specific to RAV4 EV (Electric Vehicle ) models. The Toyota RAV4 2.5L gasoline engine is covered as well as AWD and 4WD transmission options. All RAV4 options are covered other than specific instructions and procedures for the EV electric vehicle as noted above. 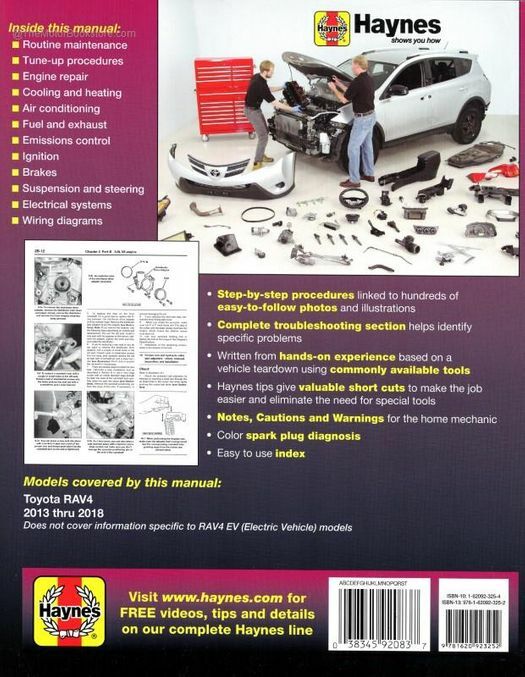 The Toyota RAV4 service manual by Haynes, like all Haynes manuals, is based on a complete teardown and rebuild of the Toyota RAV 4 by Haynes technicians, photographers and writers. The detailed and clearly written textual procedures are integrated with photos showing the most important steps to consider for each and every service / repair project that you may undertake. If you don't have experience working on cars, this manual will provide the confidence and details in simple language so you can accomplish service and maintenance tasks yourself. If you do have mechanical experience, this manual can be used as a quick guide to provide unique and specific strategies, techniques, specifications and recommendations to consider when working on the RAV4. The Motor Bookstore has been a a trusted online seller of Haynes and other DIY literature since 1997. Check out our reviews before you purchase and you will see that we are serious about providing excellent service and customer support. Ask a question about Toyota RAV4 Repair Manual: 2013-2018.